Elizabeth Spayd, the new Public Editor at The New York Times has written her first column. The previous public editor Margaret Sullivan departed recently for the Washington Post. What would prove more fruitful is for newsrooms to treat their audience like people with crucial information to convey — preferences, habits and shifting ways of consuming information. What do they like about what we do and how we do it? What do they want done differently? What do they turn to other sites for? Had we been listening more carefully and sooner, we would have known that our readers were using their phones for news while we were focused on monitors. And spending hours on social platforms before we had staffed “audience teams” to attract them. Or beginning to block ads while we were deploying “pop-ups” that took over user screens. It’s an interesting piece and the above quote sums up precisely where the blogging world was a decade ago. Indeed the core philosophy of blogging was the idea of being closer to your readers, learning from them, being corrected by them, and building loyalty and relationship with your audience. It is good to see news organisations catching up with this type of philosophy, but why has it taken so long? Today I’m in London for the Media140 event, “bringing together journalists, bloggers, social media advocates and publishers to share and discuss the effects and impact of twitter and other social media tools on mainstream media”. Looks like a great lineup of speakers. Someone is in big trouble. The pay of 250 staff at the recently launched “The National” newspaper in Abu Dhabi have been leaked online via Wikileaks. As a guide, divide the sums by five for a rough euro conversion. The sums are monthly net pay (no income tax). Rent must be paid out of salary, so the figures might not be as good as they first appear. The Guardian reports it here. Ah sure, what harm. I think it’s a good move for the NY Times. What say ye? The new website went live today. I prefer it over the previous incarnation. I haven’t started uploading photos (not that there was much to upload, perhaps some Georgia/US election ones). Not heard of it? It’s a British-based website for photographers to upload and sell their photos, sharing revenue with Demotix (who sell the photos for you). More here. Where is the news business going? I see the Government published the report of the Advisory Group on Media Mergers today. It’s pretty lengthy. I wonder should I bother reading the whole thing. As everyone knows by now the newspaper industry globally is having a bad time of it. Even a cursory look at my links will tell you how often I read about it. The question I am asking myself, in light of the dire situation in the US of late, is what newspapers or newspaper groups will survive 2009. On a share price basis, Trinity Mirror Group and Johnston Press are serious contenders for bankruptcy. Given my own vested interest in the Irish media landscape I can’t comment on the newspaper group I work for. But I will say that if either Trinity or Johnston go, they will obviously bring many Irish titles down with them. 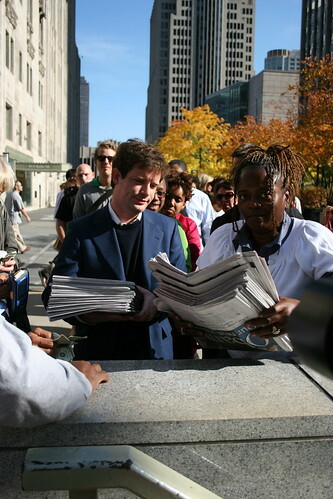 It’s proving hard for people in Chicago to get copies of the Chicago Sun Times and the Chicago Tribune. So much so that lines formed on the streets, and people bought dozens of copies each. This guy was happy with his purchase, having already bought about a dozen copies, he asked for another dozen. I see my company launched a Facebook page/group for its Breaking News section. It looks like it started back in August and it seems many invites were sent out recently. It’s a step in the right direction.